This isn’t your grandfather’s reading experience, and that’s the point. Jacek Dukaj, Poland’s most famous living sci-fi writer, has created a multi-dimensional text that explores what it means to be a human versus a machine with a human consciousness. The Old Axolotl is only being released as an e-book (from Allegro), mostly because it includes layers of hypertext and other digital elements, including diagrams of robots that can be printed on 3D printers. 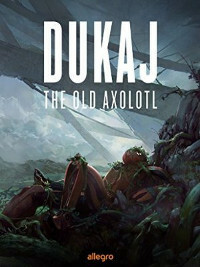 (see the Culture.pl article for more details about the book and Dukaj’s intentions). Dukaj is interested not just in telling a story about human extermination and the rise of robots, but also in how the digital experience is shaping us as humans and how we will read in the future. In a recent piece that he wrote for the magazine Książki, Dukaj argued that “[t]o read an e-book when everyday one is surrounded by [a] million virtual distractions, is like walking on a tightrope suspended over an abyss during a thunderstorm.” (“Bibliomachia”). We are constantly bombarded with images and information, but what happens when humans have disappeared and only the technology remains? But let me start at the beginning. It’s a regular day, nothing much is going on, when suddenly the news feeds go crazy about a “neutron wave” cutting down every human, dog, bird, insect (basically all organic life) that is sweeping across the planet. No one knows where it’s coming from, and only the people in the areas hit last have time to upload their consciousnesses into an unpopular and abandoned virtual reality game, InSoul3. How many “made it” before the wave exterminated all Earth life? 17,946. But of course, it’s not so simple. Many who successfully uploaded and then made straight for the Internet were “deleted” or otherwise destroyed by a virus. Others had their consciousness corrupted somehow. Some were in the middle of uploading when death hit. Bottom line: it was messy. The smart/lucky ones manage to jump into various kinds of “mechs,” bringing together a consciousness and a body so they’re not just floating around in the cloud. Only in Japan, though, was the robotic technology sophisticated enough for this joining, so what we now have roaming the Earth are Star Trooper Miharayasuhiros, sexbots, irigotchi, and other assorted mechs/toys. With human consciousnesses. Bartek, the main character and former “IT whiz,” refuses to let go of his human side, pining for the past and holding on to his former identity, as if it still exists. Throughout The Old Axolotl, Bartek breaks into melancholy philosophical musings, for instance, when he thinks “We are monstrous shadows and scrapheaps of human beings, the molybdenum despair of empty hearts.” And it’s not just him- many of the other “transformers” go through the motions of being human, such as drinking, kissing, and displaying emotions. The most pathetically sad moments in the book (in my opinion) occur when the narrator says something like “They sat and smoked. (Not really. But sort of”). When Bartek becomes frustrated about something, he “display[s] Animal the Muppet beating his head against a wall.” This is how the transformers communicate with one another, using their mechanical bodies to transmit human emotions, desires, and memories. Every time they emote, they must draw upon pop culture references to get their point across. As one of Bartek’s friends points out later, longing for a human past is pointless because even the transformers aren’t human anymore: “InSoul3 couldn’t upload the whole brain–just some currents on the surface, the shadow of its structure, whatever made a good avatar bot…There’d been no breakthrough in the digitalization of minds. Nobody had invented a way to turn IS3 into some magic psychopomp. All the humans died twenty-three days ago. We’re all that’s left.’” Cue discussions about the “soul” and “consciousness” and what it means to be human. Why indeed. After all, human evolution was also “freestyle.” And what purpose did it serve in the universe? What was the point of its existence, and what will happen now that it’s been wiped out? The machine-made humans, despite their outward appearance, are not “really” humans, the transformers concede. They, like the transformers, are merely performing humanness. I won’t spoil the ending for you, though it’s pretty haunting and also disturbing. Ok, I’ll just say that it has something to do with aliens. So if you’re interested in expanding your usual sci-fi repertoire, check out this experimental text from one of the great living Polish writers.